Records are somewhat unclear, but on this day, the left wing of the 16th Ohio remained camped near Alexandria, Louisiana, or may have moved their camp a short distance, defending the town from the Confederate forces in the area west and north of town. The right wing of the regiment remained at work on the north (or east) bank of the Red River, building a dam to raise the water level of the river, enabling stranded Federal gunboats up river to pass the rapids and move to safety. On the 2d of May a large body of rebs had passed around us and entrenched a battery so as to command a bend in Red River at Snaggy Point, about twelve miles below us. Unfortunately the first of our boats that came along [on May 3, 1864] was a transport carrying the 120th O.V.I. Without a demand to surrender or a fair warning the enemy let loose with a strong battery and thousands of muskets. Col. Marcus M. Speigel, of the 120th, wanted to fight until a gunboat could come up and help them out, but the boat was soon disabled and the Colonel mortally wounded--dying the next day--so that a majority of our fellows decided to surrender, hoisted a white flag, but some on the lower deck did not seem to understand matters, so fought on. This caused the enemy to disregard the signal of surrender and re-open their fire with hellish fury. The boat in swinging around touched the opposite shore and many of the men jumping off and scrambling up the bank escaped. Those left on the boat alive became prisoners and were taken to the prison pen at Tyler, Texas, where they were kept to almost the end of the war. The men that escaped were accompanied by Lieut. Col. Slocum of the regiment. Back from the river they assembled and decided what to do. Not being in sufficient force to rescue their comrades from the overwhelming number of the rebels, they thought best to husband their ammunition and march for Alexandria, where they arrived in a weary condition the next morning and were promptly furnished with rations and comfortable quarters. 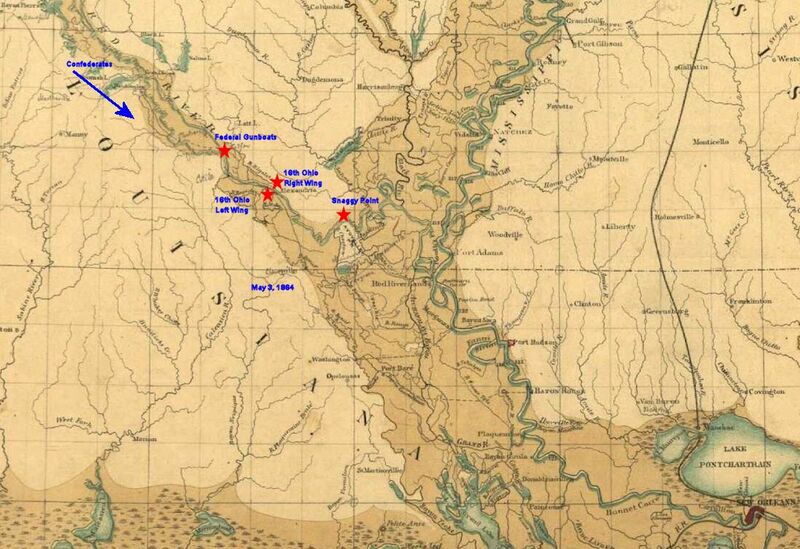 This period military map shows the approximate position of the 16th Ohio's left wing in camp near Alexandria, Louisiana, and the right wing on the opposite bank of the Red River helping to build Bailey's Dam, on May 3, 1864. The Federal gunboats, under Admiral David Porter, were trapped several miles upstream, above a set of rapids that were not navigable during low water. Also shown is what is believed to be the location of Snaggy Point, on the Red River, about 12 miles down river from Alexandria, where, on this day, May 3, 1864, the 120th Ohio was ambushed and decimated by a Rebel force which had circumvented the Federal lines. 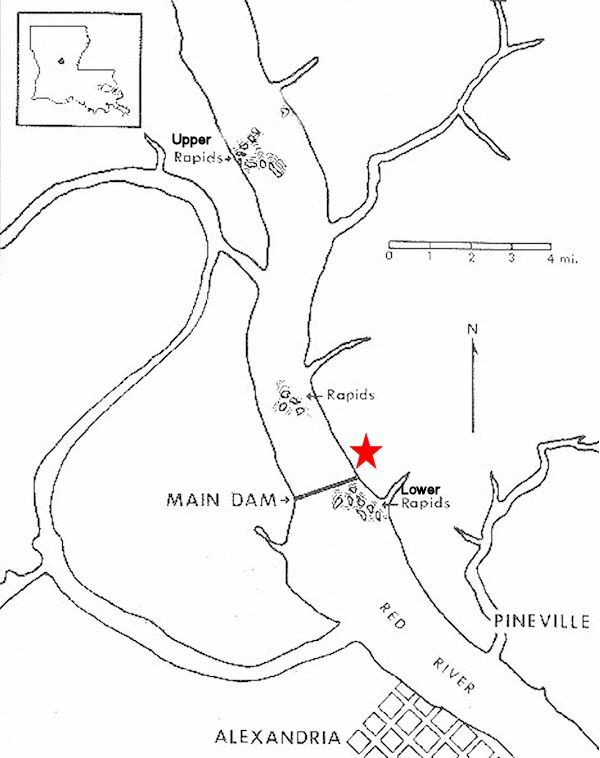 This map shows the location of the dam, across the Red River just north of Alexandria, Louisiana, designed by Col. Joseph Bailey and built by troops investing the city and under Gen. Nathaniel Banks, including the 16th Ohio. The right wing of the 16th Ohio was probably the first unit assigned to begin building the dam, part of a desperate effort to raise the river level and allow the Federal gunboats, stranded above the upper rapids, to move down the river to safety. Many other soldiers would join them. The 16th Ohio began work on the east side of the river while other units worked from the west side.